There have been numerous initiatives introduced by authorities as well as free zones in the UAE during the course of 2017 and 2018. 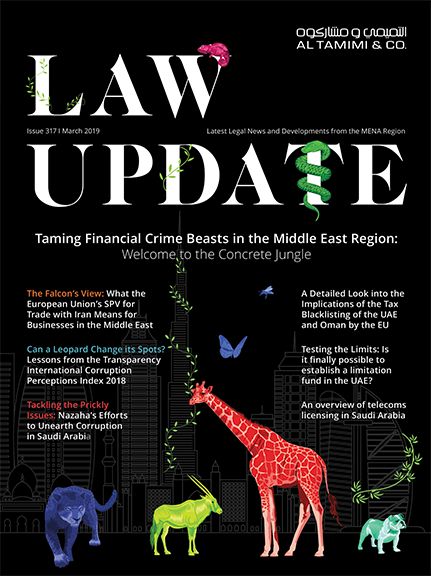 While the UAE has been actively preparing for Expo 2020, the new foreign investment regime has been under governmental discussion and the Jebel Ali Free Zone Authority Offshore Companies Regulations 2018 have come into effect and the Dubai International Financial Centre Authority has been working full time on revisions to the Companies Law (DIFC Law No. 2 of 2009) and their operating regulations. The countless hours dedicated to that major project resulted in the recent introduction by the Dubai International Financial Centre (‘DIFC’) of the new companies’ regime under its Companies Law (DIFC Law No. 5 of 2018), Operating Law (DIFC Law No. 7 of 2018), Companies Regulations and Operating Regulations (together the ‘New Legislation’) all of which came into effect on 12th November 2018. The New Legislation replaces the former Companies Law (DIFC Law No. 2 of 2009) and its operating regulations and revises a number of areas that concern the registration and operation of companies in the DIFC. The New Legislation has been long awaited by a wide variety of international and regional parties. These include medium and small size private companies limited by shares, their shareholders and directors, as well as legal and financial professionals advising entities considering the DIFC as the jurisdiction in which to operate or those already operating in the DIFC. prescribing a robust sanctions’ regime should companies not comply with DIFC law. Similarly, to some other jurisdictions globally, the Registrar of Companies’ (‘ROC’) role will be to supervise and monitor compliance by companies with DIFC law rather than overregulate the day-to-day operations. introducing, on a statutory basis, a list of duties and responsibilities of directors of a company. In this article, we shall focus on the factors we consider of major concern to the majority of DIFC licence applicants and existing DIFC companies. that can be imposed by the DIFC ROC for non-compliance with the New Legislation. Previously, companies could be incorporated in the DIFC in one of two way; namely as a limited liability company or a company limited by shares. Currently, limited liability companies have been abandoned and the only companies that can now operate in the DIFC are companies limited by shares: private and public. What Happens to Existing Limited Liability Companies (‘LLC’)? The ROC will instruct each LLC currently registered within the DIFC to convert the LLC to either a private or public company limited by shares in order to comply with the New Legislation. Along with the introduction of the New Legislation comes a new standard of DIFC Articles which mirrors the provisions of the New Legislation. The requirement for a legal opinion to be provided alongside the modified Articles of Association is replaced with the incorporator’s statement (for initial Articles) or director’s certification (for post-incorporation revisions) of compliance with DIFC law regarding the proposed amendments to the Articles. Another significant amendment is the introduction of a statutory pre-emption rights (which can be excluded under the Limited Company’s Articles of Association). Along with revising the minimum share capital requirement from USD 50,000 with separate share capital requirements for public and private companies, a public company will be required to have a minimum capital of USD 100,000, of which at least 25 percent must be paid up. However, a private company will not be required to have a minimum share capital, and no initial allotment of shares requirement. declaring interest in a proposed transaction or arrangement. In order to ensure companies adhere to the provisions of the New Legislation, administrative fines ranging from USD 2,000 – 30,000 per breach of DIFC law have been introduced. the contraventions and enforcement of administrative actions of the ROC. The introduction of the New Legislation enhances the already sophisticated legislative regime of the DIFC, giving existing DIFC companies and new investors greater flexibility in terms of managing their businesses, with wider options with regards to the regulation needed. The introduction of directors’ duties heightens their level of responsibility and accountability which, in turn, gives extra comfort to investors. The decision taken by the DIFC to revamp the Companies’ Law and introduce the New Legislation evidences the the DIFC’s commitment to boosting the attractiveness of doing business in the DIFC. Al Tamimi & Company’s Corporate Structuring Team regularly advises on DIFC related matters. For further information please contact Samer Qudah (s.qudah@tamimi.com) or Izabella Szadkowska (i.szadkowska@tamimi.com).